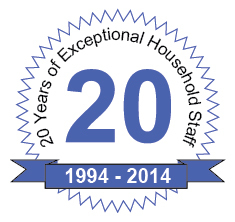 Austin, Texas – August 5, 2014 – Austin-based MBF Agency, Texas’ largest and most established household staffing agency, turns 20 years old on August 24. In the midst of this milestone, MBF Agency is also seeing record placements as Austin’s economy continues to grow. According to the Austin Business Journal, “Austin is one of the top cities for women in the workforce.” 1, and “Overall Texas saw its largest year-over-year job growth in nearly 17 years.” 2 These factors contribute to the rising need for more home and childcare assistance. Referral from a friend: After 20 years in Austin, the agency’s reputation has only grown stronger, and the word of mouth continues to grow. Screening / Background Checks: The 10-step screening process is unparalleled in the industry. Quality of Caregivers: Using a combination of both quantitative and qualitative information gleaned from the screening process, MBF Agency weeds out 90% of interested candidates. MBF Agency is the leading household staffing provider in Texas and Colorado. Since 1994, MBF has been referring the highest quality nannies, sitters, senior caregivers, and household staff, with only 10% of applicants making it through a detailed screening process including extensive reference checks and a thorough criminal background check. This commitment to quality has resulted in numerous awards including “Best Nanny Service” in the Austin Family Magazine reader’s poll and “Best Sitter Service” by Dallas Child and Fort Worth Child Magazines. MBF Agency owners hold two board seats in the Alliance of Premier Nanny Agencies (APNA) and is a member of the International Nanny Association (INA). For more information, visit mbfagency.com or call 512.346.2229.